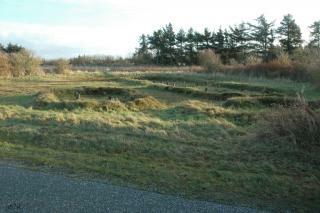 In 1959-62, an unusually well-preserved Iron Age farmstead was excavated on uplands at the mouth of Varde River. The burnt-out shells of four buildings are clustered around a system of stone paths running from their entrances. The longest building is divided into a section for human habitation, with a fireplace, and a stable section. The nearest two smaller buildings may have been the farmstead's workshop and outhouse. Together with the fine pattern of stone cobbles in the yard, these would have represented an impressive estate, worthy of only the most successful farmer. The burnt-out structures contained countless earthenware vessels abandoned by the inhabitants when they fled the fire. The Myrtue site has a special feel to it. The cobblestones massage the soles of the feet, now, like the morning some 2,000 years ago when the Iron Age farmer last walked here, before the farm burnt to ashes. Now I walk along the cobbled path to the yard, across to what was once the main building. Admire the cobbled stable floor with its central gully carefully edged in large stones. I can almost smell the ammonia from the stabled cattle, sheep and horses. Smell the smoke from the fireplace at the other end of the building. Hear the faint claps of distant thunder. A warning of the fateful bolt of lightning that would destroy the farm.